Your schedule rules could be different during the holidays. This is why you can add as many schedules as you want to your 2houses calendar. The system will know which one to display. 1) First, click on “Calendar” on the upper menu, then “Parenting schedules” and then click on “Add a parenting schedule” to create a second schedule. 2) Now click on the first day of the week, and click on which parent the children will spend the night at. Do the same for the following days. If your schedule is defined for more than a week, add a week by clicking on “Add a week”. Choose a start date and an end date. If the schedule has to be repeated, choose a date on “Repeat until…“. If the schedule is not going to repeat (meaning that it starts at the first day you edited it and it ends at the last day you added it) click on “This schedule is not repeated and apply ...”. Once you’re done, click on “Continue“. 3) The system shows a list of the exchange time, when your children change from you to the other parent and vice versa. You can choose (or not) a place and time for the exchanges. In case of you haven’t defined a time and place, leave the box “There is no specified place and time” checked. If it’s not the case, uncheck the box and enter a place and a time for the exchanges you want. Once you’ve added places and times click “Save this planning” at the bottom of the page. 4) Your schedule is now displayed in the “Parenting schedules” list. You can delete it or edit it by clicking on the arrow to the right. You can also “Sort the schedules”. This is a very important aspect of the system. Planning requires order! The planning on top will be superimposed on the given period. Be careful, make sure you assimilated this before modifying any existing plans. 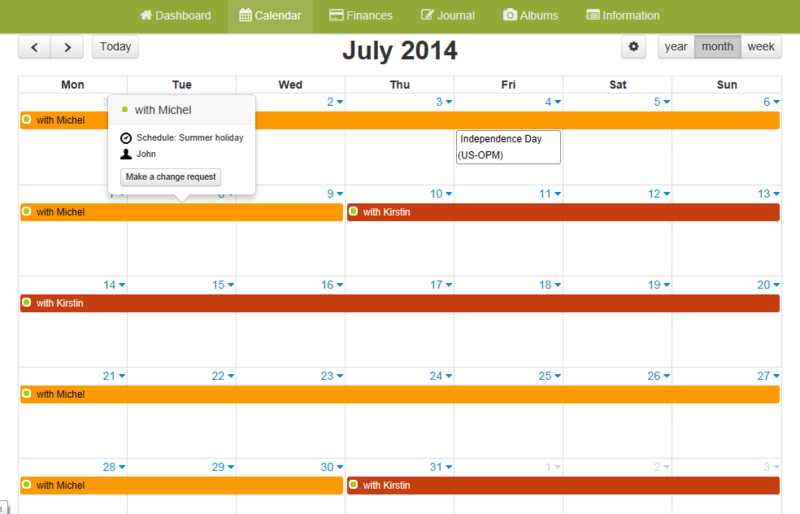 The schedule is now displayed in your calendar (according to the color the users of the account have chosen). That’s it! You’ve added your holidays custody schedule! Getting organized has never been so easy!